Goliath has been a part of my family for 4 years now. We got him from a breeder when he was 10 weeks old. He knows my every move and mood and follows me every step I make! His favorite time is when he gets to run loose at grandpas farm and play with his frisbees! His best friends are a black lab and a Yorkie. He LOVES mommy and daddy...but unfortunately no one else. He has become familiar with my immediate family and is extremely gentle with my 85 year old grandmother. But...no one else can enter our home. It is quite a problem. I want everyone to be able to enjoy the funny baby like I do...but he doesn't want to meet anyone else. He doesn't want anyone else to touch him and he especially doesn't want anyone else in his yard. Even as a pup, he would hide behind my legs and bark at the neighbors. Now he has a very scary bark and has started biting people that get too close to his territory. We have to take all precautions. No one is allowed to enter our house without knocking..EVER. I even have to get his vet to knock on the door before he can enter and it takes Goliath 30 minutes of warm-up before Doc can even touch him. Eventually he calms down, but no one else wants to be that patient to play with a dog. I'm considering children in the next couple of years and I really want to trust Goliath with a little one at some point, because I won't just put him outside and leave him. But it is a risk that makes me nervous. Any suggestions for my bad behaviored German Shepherd? 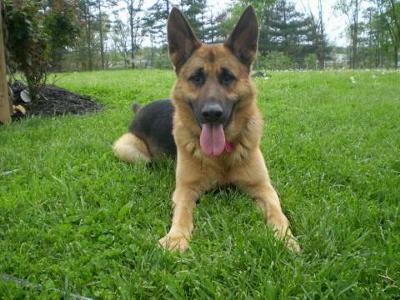 Total German Shepherd: I can sum it up in one word - Training. Your boy needs socialization and lots and lots of training by a good dog trainer. Changes won't happen over night - it will take time - but if you can find a good dog trainer in your area that will work with you and your GSD then you'll definitely be on your way to a successful and less stressful outcome. Good luck!